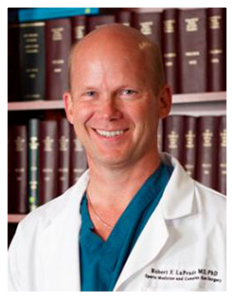 Listed as a “Top Knee Surgeon in America“, Robert LaPrade, MD, PhD is a complex knee specialist, known worldwide for offering innovative treatments in Sports Medicine. Dr. LaPrade is passionate about healthy knees. He has been studying the knee joint along with providing orthopedic knee surgery and expert care for more than 15 years. Specializing in complex and traumatic knee injuries involving the posterolateral corner, as well as other areas of the knee, Dr. LaPrade’s experience is unparalleled in accurately diagnosing and treating compound, multifaceted knee injuries. Dr. LaPrade is internationally recognized for his dedication to providing state-of-the-art procedures to treat complex knee injuries. His passion for research in orthopedics is evident as he continuously seeks to improve diagnostic tests, surgical techniques and patient outcomes for knee injuries. His work ethic and productivity is recognized and appreciated worldwide. Dr. LaPrade takes the time to understand each patient’s unique circumstances in order to recommend the best treatment option for the specific injury and lifestyle goals. Regardless of how complicated the problem or complex the injury, Dr. LaPrade is committed to finding a solution for each patient. Dr. LaPrade recognizes that providing the best knee injury treatments to his patients requires the collaboration of a strong team. Together, Dr. LaPrade, his team and the patient all work for the best possible outcome – an accelerated recovery from knee surgery and return to an active lifestyle. Written by world experts in the field, The Medial Collateral Ligament and the Posteromedial Corner: A Comprehensive Analysis is an up-to-date, unique evidence-based resource that will provide the reader with the tools to deliver comprehensive care for the most common ligament injuries in the knee.